The Exhibition is truly historical in the territory, born in 1971, and today it counts a large number of the main Spumante producers in the area of Conegliano and Valdobbiadene. The Exhibition is part of the Primavera del Prosecco (the Spring of Prosecco), one of the most important event devoted to the Prosecco and other wines of the area, such as the Conegliano Valdobbiadene Prosecco Superiore DOCG, the Valdobbiadene Superiore di Cartizze DOCG, the spumante Le Rive, the Verdiso IGT, the Colli di Conegliano DOCG, the Refrontolo Passito DOCG Colli di Conegliano and the Torchiato di Fregona DOCG di Conegliano. 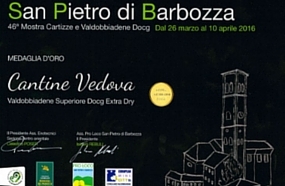 This medal enriches the long list of awards obtained by the Vedova wines in 2016.